A nice piece of time art. It’s a clock that is dead, until you break its glass case. Then it begins ticking. You are now committed to whatever. The artist, Alex-vf, says “it helps you make up your mind.” Here is the official description (via Seth). 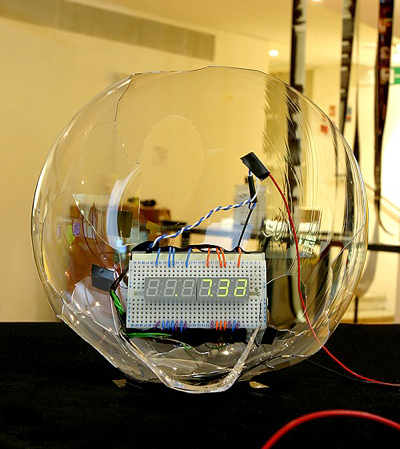 The “Birth Clock” is a fragile glass object containing a digital clock that is not working; it is designed to help you to come to a decision when you’re stuck at a specific point in life. Smash the glass, and the clock will start to work, leaving you with the broken object as a reminder of your dramatic decision.